Hey there! This is Brian from This Cookin’ Dad and I’m excited to share my twist on a family favorite. Puppy chow (or muddy buddies, monkey munch, etc.) is one of those classic treats that show up at holiday parties and in kids’ snack bags all year long. It’s something that I grew up with and that we make in our house every year. This year, though, I wanted to shake things up just a little by adding a little pumpkin spice to the mix. The result is a sweet treat with that little something extra that makes everyone wonder just how you do it. My family and, in particular, my wife’s family are very traditional. You can rock the boat a little, but you’d best not tip it over! You wouldn’t believe how much fussing I got when I messed with my wife’s grandma’s Banana Bread! Now everyone loves it! When it comes to the holidays, though, you just do not mess with the family’s favorite treats. Even when I try out a new cranberry sauce for the table, it has to be in addition to what we always have, not in place of it. Change just needs to be a little more incremental for some people. That’s a big part of what inspires my recipes. Some family favorites don’t need changed, so much as updated or tweaked a little. That’s what I’ve done with my Puppy Chow with Pumpkin Spice Snow recipe. By adding 1 Tbsp. of ground cinnamon, 1 1/2 tsp. of ground ginger, 1 tsp. of ground nutmeg, and 1/2 tsp. 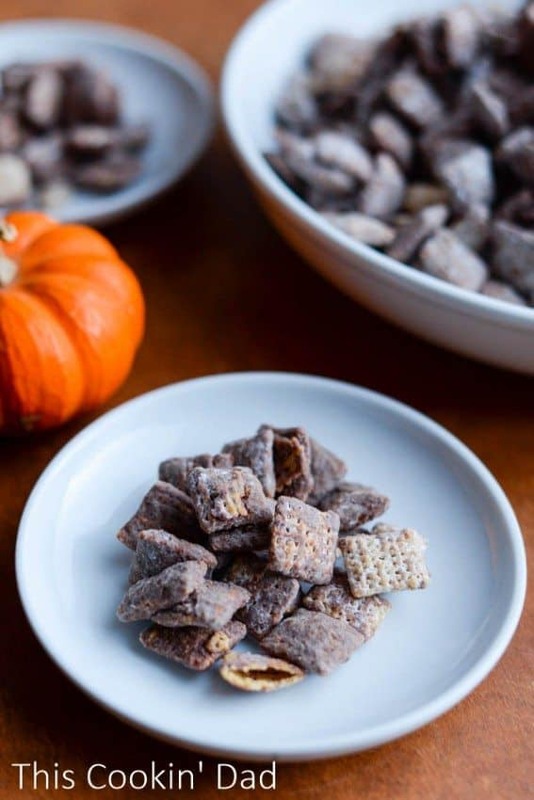 each of ground cloves and ground allspice to 3 cups of powdered sugar, you get a sweet, subtle flavor of pumpkin pie spice that is a perfectly seasonal way to dress up your Puppy Chow. 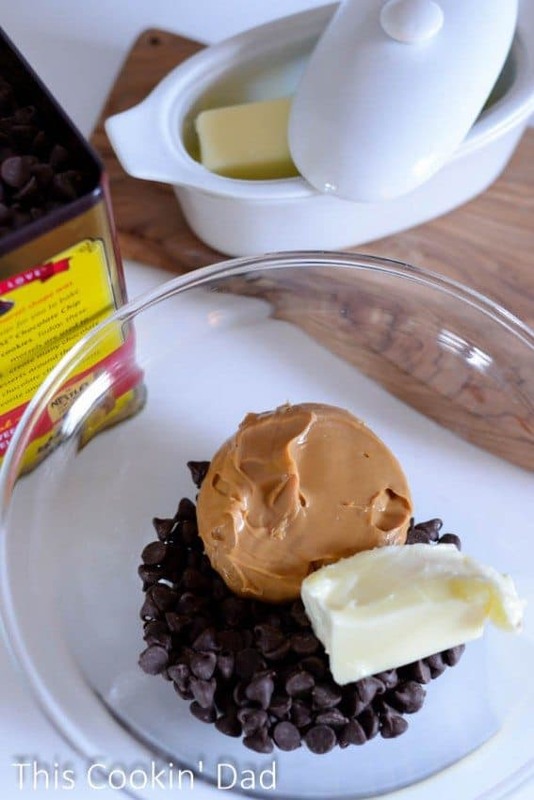 Combine the chocolate chips, peanut butter, and butter into a microwave safe bowl and microwave for 1 minute. Remove from the microwave, stir to combine, and microwave in 30-second increments as needed until it’s all melty and gooey. Pour the chocolate mixture over the cereal. You could use chocolate or cinnamon flavored cereal here, but I think that you start to lose the subtle flavors of the pumpkin spice when you do that. 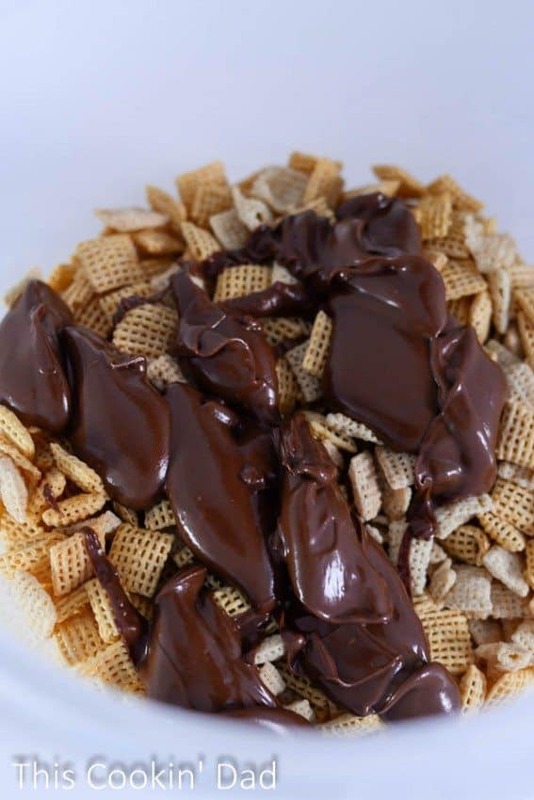 Gently stir the cereal until it is completely coated with the chocolate mixture. 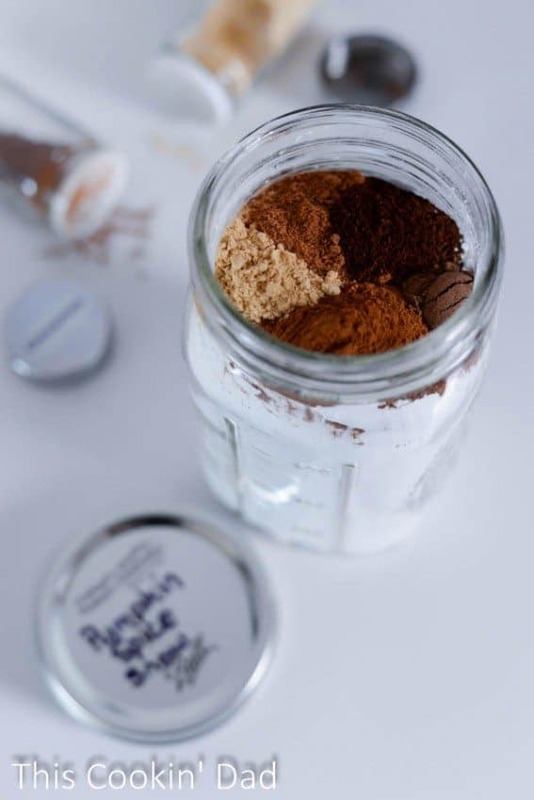 Pour in 1 1/2 cups of Pumpkin Spice Snow and shake or stir to combine. (I use an 8 qt. plastic tub to stir and then cover with the lid after pouring in the snow. Use zip top storage bags if you don’t have a tub like this.) Serve by the handful! I honestly can’t say how long it’ll stay fresh because it never lasts long enough to go bad! You may be wondering why I refer to my powdered sugar mixture as Pumpkin Spice Snow. Well, in our house, all powdered sugar is snow! One day, when our kids were tiny, we sprinkled powdered sugar on their pancakes and my oldest, Grace, who was 3 or 4 years old at the time, said “Ooh, it looks like snow.” She’s 9 now and all 3 of our kids call it snow! The great part about this recipe is that we have purposely made too much of the Pumpkin Spice Snow. It’s either enough to make another batch of Puppy Chow or to sprinkle onto some of my favorite recipes. 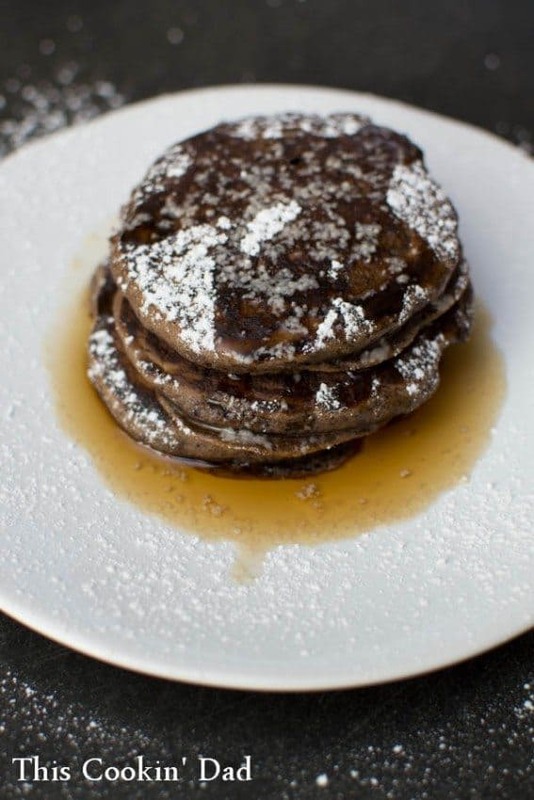 Try it out on my Buckwheat Pancakes for a yummy breakfast. 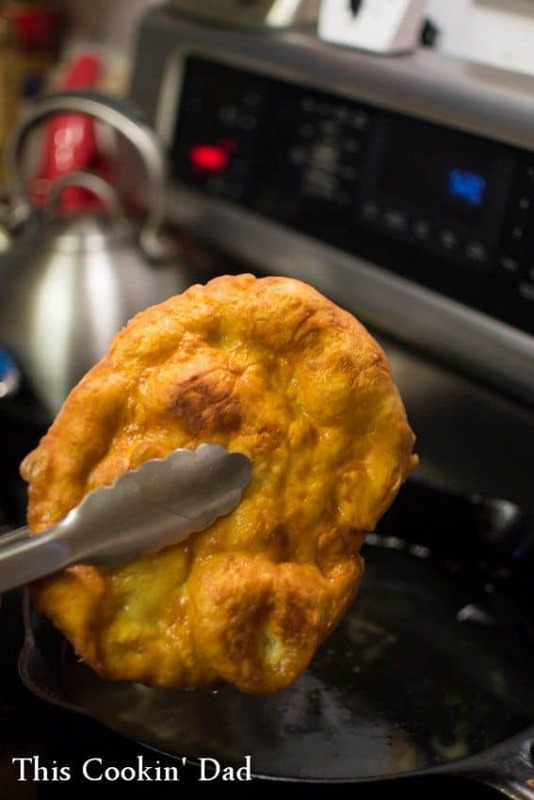 Give a sprinkle to a piece of Indian Fry Bread for an easy dessert. 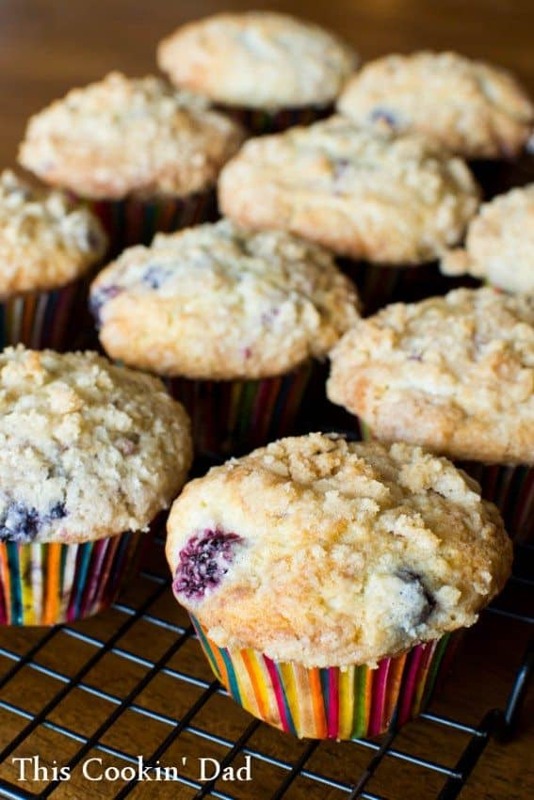 You could even dust some onto my Berry Best Muffins for a great after school snack that combines the fresh, tart berries of spring with the deep, warm spices of fall. YUM! How do you change or update the recipes that you’ve come to know and love? Hi, my name is Brian and I would love for you to come visit me on This Cookin’ Dad. I’m a husband, father, veteran, and teacher and my camera and I are on a journey to find, taste, and snap food from all over and bring them back to share with my family and with yours. Make sure you follow along on Facebook, Twitter, Pinterest, and Instagram to join my adventures.